Chewy (not-cakey!) 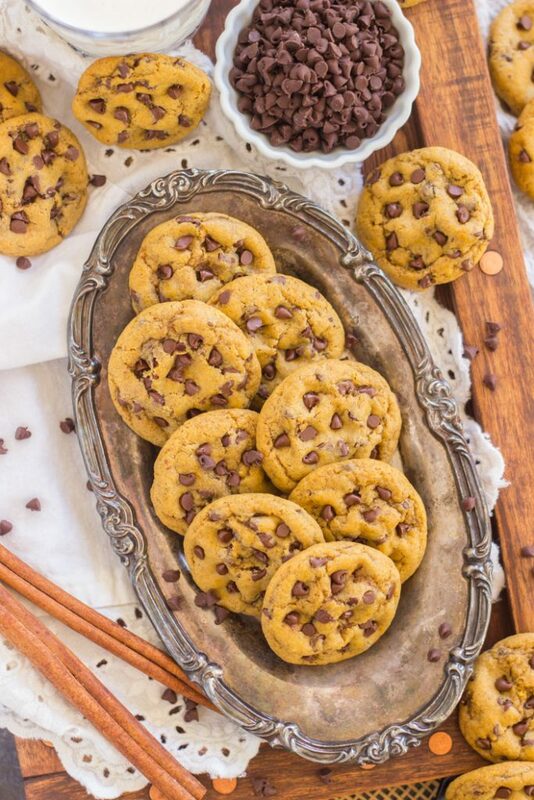 pumpkin cookies, loaded with spice, and dotted with LOTS of semi-sweet chocolate. 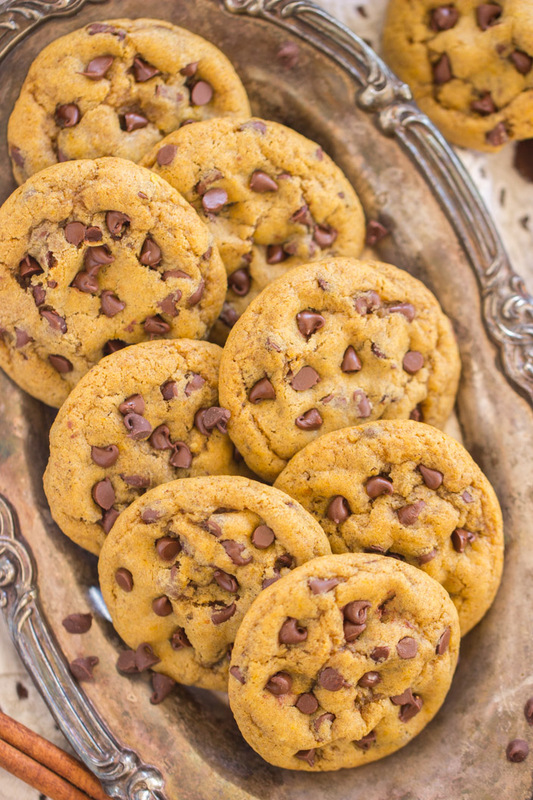 These Chewy Pumpkin Chocolate Chip Cookies are a beautiful marriage of a favorite fall flavor and a classic cookie. 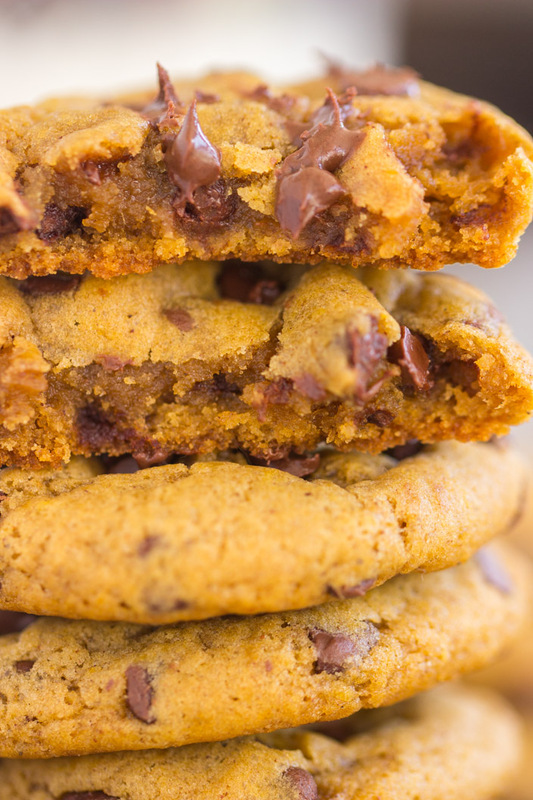 These Chewy Pumpkin Chocolate Chip Cookies are super simple to whip up, and boast high-reward. This is the year of cookies, if you haven’t already noticed. 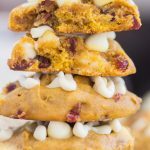 I went cookie crazy this fall, and it carries into Christmastime baking too. You just wait. 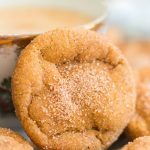 Over the last few weeks, I shared about a half-dozen different Amish Sugar Cookies variations, so check ’em out. 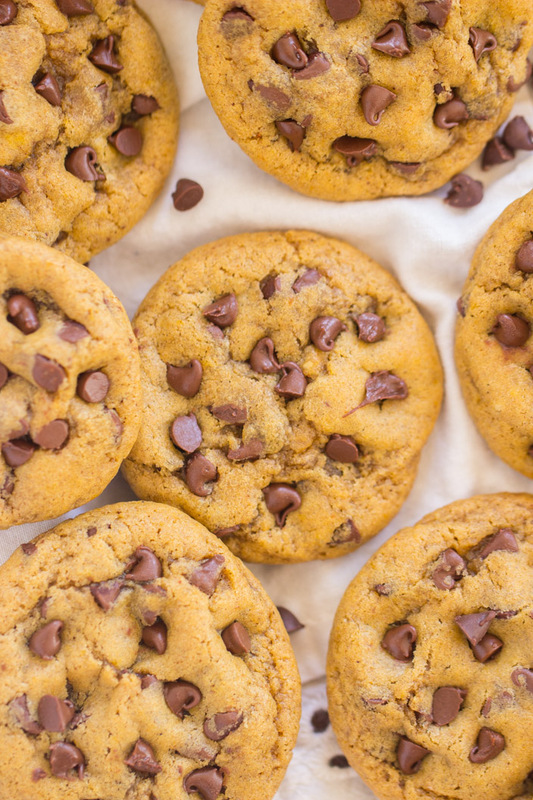 Today though, these Chewy Pumpkin Chocolate Chip Cookies… these are definitively chewy. I actually LOVE a cakey pumpkin cookie too, when done right (see Pumpkin Cookies with Brown Butter Icing). However, when you want a classically chewy cookie, then that’s what you want. So that’s what these Chewy Pumpkin Chocolate Chip Cookies are: they have barely crispy edges and very chewy middles! They’re super soft, not-at-all cakey, and overall, very chewy. 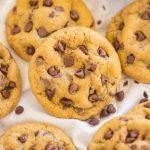 Remember Soft Batch chocolate chip cookies? These are those, but with pumpkin and spice. As a kid, we loved Soft Batch chocolate chip cookies. 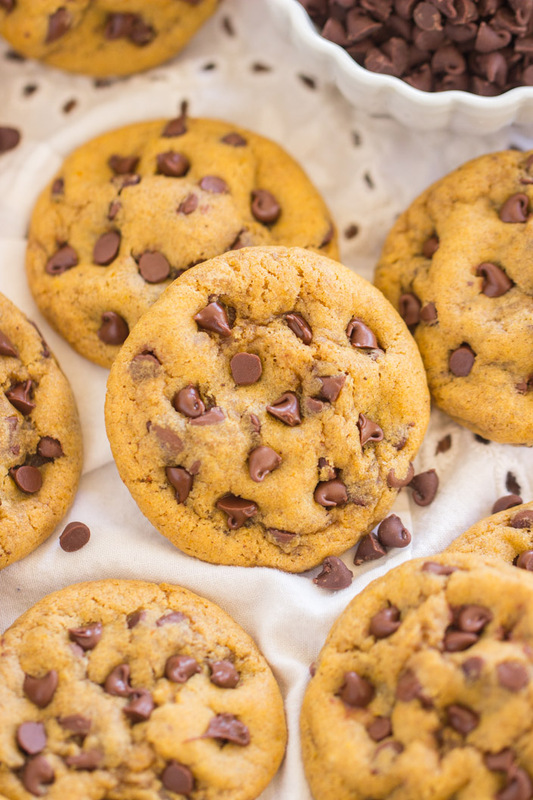 They were our favorite store-bought chocolate chip cookie. I feel like those don’t get as much hype these days as they used to, but they’re a great soft, chewy cookie. 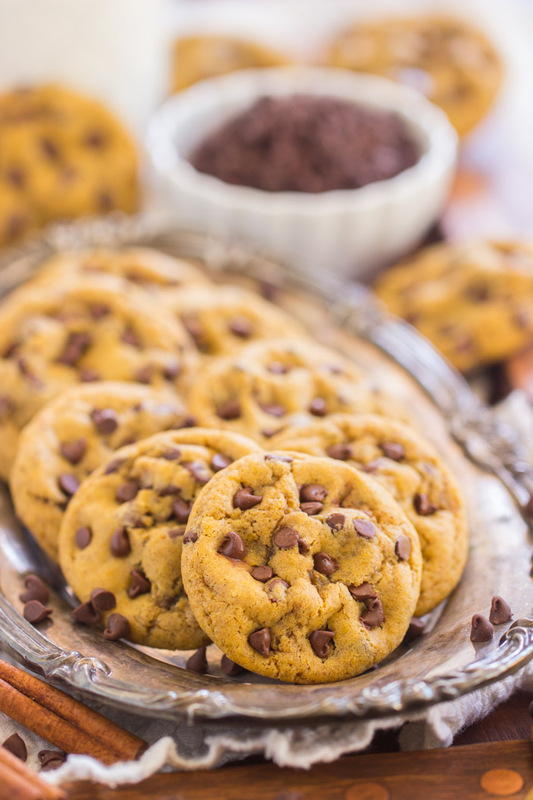 These Chewy Pumpkin Chocolate Chip Cookies are super reminiscent of those, but madeover for fall. I was skeptical of pumpkin and chocolate together for a really long time. I was convinced that they weren’t a great pairing and that it was gimmicky to combine them. As though people were just searching for more ways to add pumpkin to things, even if it didn’t make sense. This was all before I actually tried the duo myself though. Now I LOVE pumpkin and chocolate together. They blend and marry much more harmoniously than I ever expected. I wouldn’t necessarily say that they’re a natural pairing, like peanut butter & jelly, or spaghetti & meatballs, but they 100% work and are super delicious together. Pumpkin, especially when it’s heavily-spiced, makes a pretty strong impression. Semi-sweet chocolate also makes a strong impression. 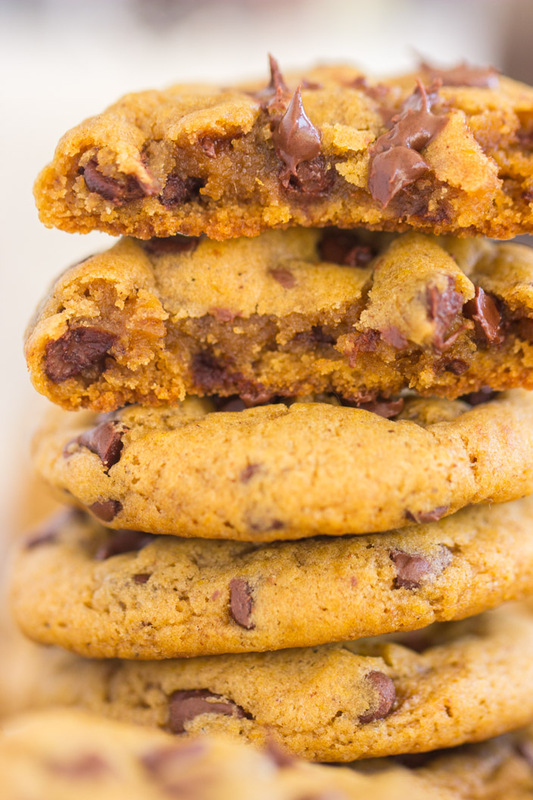 Both the major flavor components in these Chewy Pumpkin Chocolate Chip Cookies are pretty strong personalities, if you will. You’d think they would overpower each other, or that they might compete with each other, and they hover very close to the edge, but they don’t. They both make bold appearances, but they don’t edge each other out. 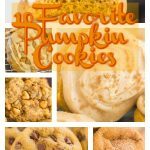 It’s actually my favorite thing about pumpkin and chocolate together – they almost compete with each other, but manage to complement. Anyway, you definitely get pumpkin, you definitely get spice, and you can’t miss the chocolate. 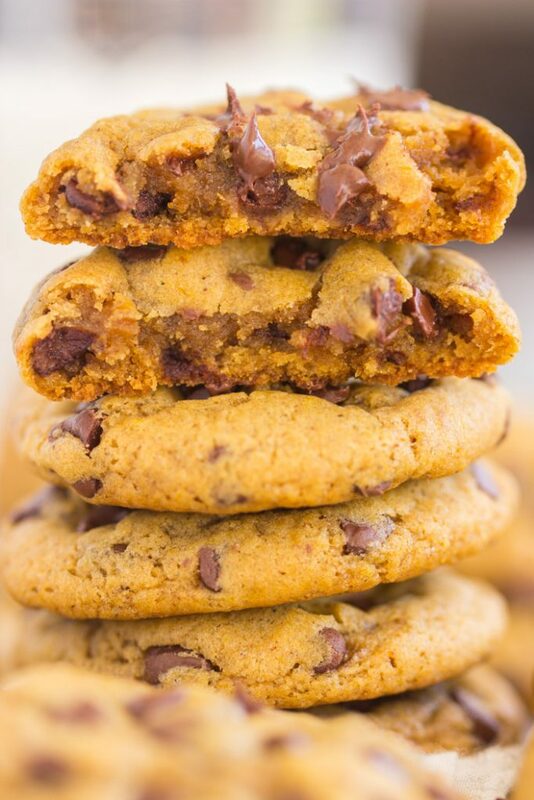 Each have their moment in these Chewy Pumpkin Chocolate Chip Cookies, and they each get to shine in the spotlight. These are impactful cookies in the flavor department. 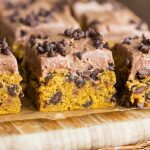 If you’ve also come to appreciate pumpkin and chocolate things, check out these recipes featuring the pair, these Pumpkin Chocolate Chip Bars, this Pumpkin Chocolate Chip Brownie Cheesecake, and this Triple Chocolate Pumpkin Trifle. 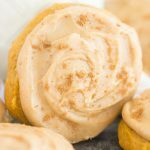 And if you want to explore other chewy pumpkin cookies, check out these Pumpkin Spice Latte Cookies or these Soft & Chewy Pumpkin Snickerdoodles! In a large bowl, whisk together butter, brown sugar, egg yolk, vanilla, and pumpkin. In a medium bowl, whisk together salt, cinnamon, pumpkin pie spice, clove, baking soda, and flour. Cover and chill cookie dough in the refrigerator for at least 2 hours. Overnight is fine, but do not skip this step. Dough will be quite firm. Scoop the dough by large teaspoonful, and shape into balls. Remove from heat, and allow to cool on cookie sheets for 2-3 minutes before removing to wire racks to cool completely. 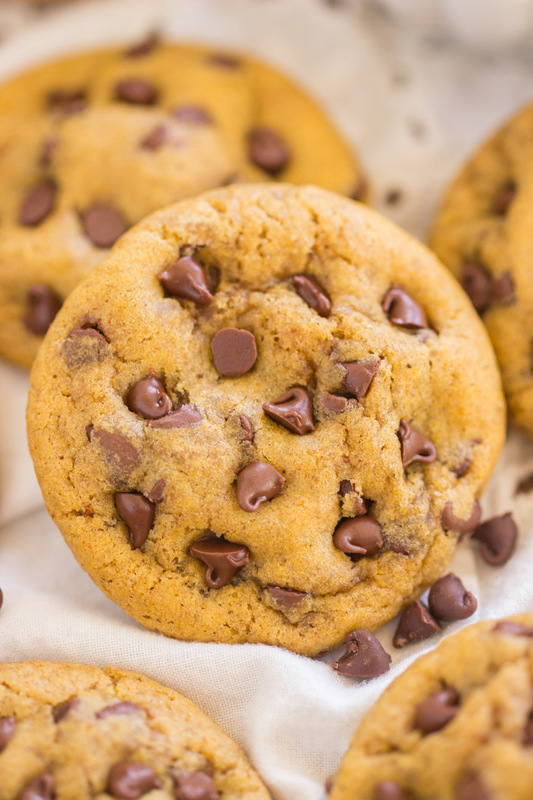 If desired, using remaining 1/3 cup chocolate chips to press into the tops of the cookies while they're still warm to give a nice bakery appearance. I like extra punch of clove, but another reader found the clove to be a bit overpowering. It is listed as optional - please include a pinch or 1/4 tsp according to your preference! Ugh, these look so good! I have tried other pumpkin cookies and you’re right, they can definitely be more cakey. Can’t wait to try these out! 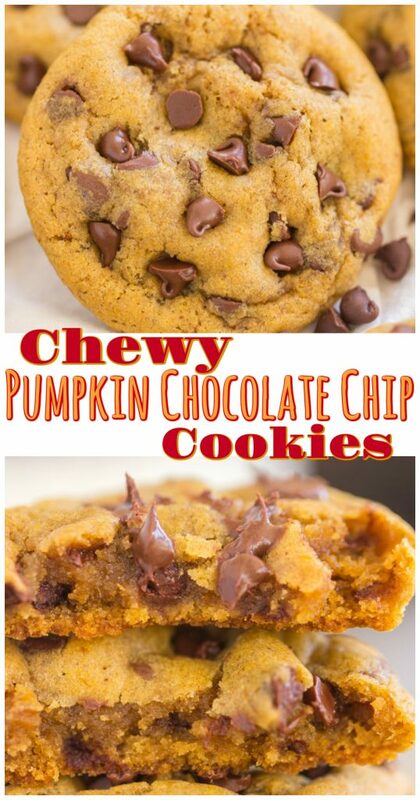 I have a great cakey pumpkin cookie that I really love, but yes, who doesn’t usually prefer a chewy cookie??? 🙂 Xoxo. Thanks for your comment! I made these for a work gathering. The texture was amazing but the cloves were too overpowering. I will make again only eliminate the cloves. Super easy to make. I made the batter the night before and baked the next day.